What Should I Do If My Unemployment Benefits End? Can Unemployment Benefits Run Out? Unemployment benefits can run out. Generally, they will only last for twenty-six weeks, which is six months. However, many states offer extensions on the benefits when the unemployment rate is higher than normal. To continue to receive your benefits you should be applying for work each week. You may not qualify for unemployment benefits depending on why you lost your job or how long you worked with your employer. If you are an independent contractor, you will not qualify for benefits at all. As soon as you lose your job, you need to sit down and create a new budget. This bare-bones budget should cut out all of the non-essentials and luxury items. You should cancel unnecessary services such as cable or a gym membership and scale it back. Although you may receive a severance package and unemployment benefits that currently meet your regular needs, you will want to make your savings, emergency fund and other money last as long as possible. It is in case your benefits do run out in the future. Cut all unnecessary spending now. Remember to prioritize health insurance and other insurance over entertainment. Be sure you are frugal in all of your spending. Start cooking at home and find other ways to save every day. If you are close to losing your unemployment benefits, then you need to create an action plan to fall back on. It means an even tighter budget with additional plans on what to do for housing, to cover your car payment and other expenses. If you are renting, you may try to get out of the lease and explain that you are unemployed. You may choose to have a roommate come to help share expenses, or you may choose to move home temporarily while you look for work. 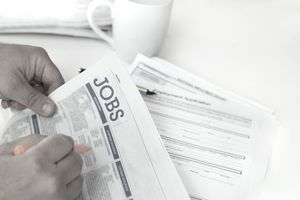 Make finding a job your first priority since the longer you are out of work, the more difficult it can be to find a job. Protect your finances by paying your bills on time. Consider taking a lower paying job if you are about to lose unemployment. Additionally, you may consider picking up part-time or temporary work to help you out while you are continuing to search for a job. You may begin freelancing in your field and discover that you can make a lot of money doing that. You may also find that you can pick up odd jobs to help supplement your income. Once your unemployment benefits have run out, you should really consider taking a temporary job or waiting tables. It can save you from being turned out on the street or from going hungry. Think outside of the box when it comes to looking for a job. Be willing to move to another area if there are better jobs elsewhere. Consider working for yourself or as an independent contractor. You should continue to look for work on a regular basis and utilize your networks to help you find a job. It is easy to become discouraged in a difficult job market, but eventually, you should be able to find a job. Considering expanding the field that you are looking in, as well as the geographical location. You may be able to find a great job in a different state or city. If you are not getting any interviews, take a seminar on writing your resume and cover letters. Your city or county may offer seminars to help people find jobs. You can also look for classes taught at local churches, libraries or community centers that can help you. It may be worth paying someone to write your resume if you have a difficult time with it. If you are getting to the interview stage, but you are not receiving any offers, you need to get help with your interviewing techniques. Again you can look for help with this through your local unemployment office. They can still offer you help with looking for a job even if you do not qualify for weekly benefits. It is important to continue to be proactive until you find a good job that can support you and your family. Use all resources that are available in your area. Work your network for job information. Often having someone in the company contact human resources for you can increase your chances of getting an interview. Make sure your online resume is updated. Your LinkedIn page can make a big difference when you are looking for a job. If you are unable to make your monthly payments, you should contact your creditors. Your student loan can be put on deferral if you are unemployed, and you should do this as soon as you lose your job. While your creditors can still report you to collections when you fail to pay, you may find additional help or assistance while you are unemployed if you contact them. Some credit unions will let you skip a car payment and extend the loan by a month in special circumstances. There are emergency programs in place to help you cover the costs of food and your rent through each county. If your unemployment runs out, you will likely qualify for food stamps. You may also qualify for child care assistance while you are looking for a job as well as help with rent or utilities. You do not know what you will qualify for until you apply, and it is worth the time to visit your local office to find out what help you can get while looking for a job. Additionally, you may want to look into local food pantries in your community that can help you.